The Department for Exiting the European Union recently announced that most businesses have not ‘prepared in earnest’ for a no-deal Brexit. 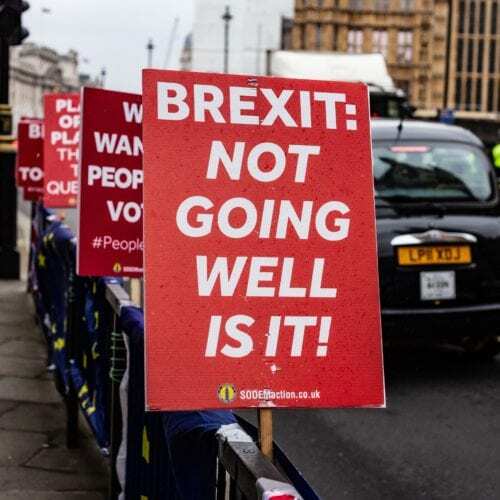 Whilst a no-deal Brexit, depending on who you believe, is less likely that one week ago, the nature of Brexit and its impact remains uncertain. Leading Change is urging companies to formulate a flexible approach to business strategy enabling them to adapt successfully whatever follows a Brexit ‘deal’ or ‘no-deal’ scenario. “If organisations don’t have some alternative plans in place already, they urgently need to speak to us. Don’t underestimate the value of working with experts in change leadership to ensure that your business is equipped to navigate the complex business environment Brexit will deliver,” said Mark Bouch, our managing director. Take time to think about the ‘kickers and killers’: Kickers are potential opportunities that Brexit could create – have they been identified, will these opportunities be identified early what will be the response? Killers are the nightmare scenarios that will derail a business. Have these scenarios been identified and the risk they pose to the business and/or clients’ businesses? Rehearse responses to major scenarios. Does everyone know what to do and how the business will react? Communicate, communicate, communicate. We are living in uncertain times. If C-level executives don’t own the communication space with staff, stakeholders and clients, then they are more likely to listen to others. What are the most important messages you need to communicate, to who and when about post- Brexit plans? Be realistic. It’s perfectly OK to set realistic expectations and commit only to what can be delivered during this rapidly changing period. One of our business clients refers to “pessimism as a strategy”. This is more pragmatic than it first sounds: don’t over-commit, expect the unexpected and plan accordingly. Identify what you don’t know. Make your assumptions transparent. Be visible in times of uncertainty. People look to leaders to shine a light on the way forward, not to fuel uncertainty. “Brexit is forcing many businesses to learn quickly to cope with uncertainty. When the outcome is determined they will need to adapt quickly as the business environment changes. The fundamentals don’t change. Effective scenario planning, excellent change leadership and great communication will help companies navigate Brexit at the same timing as focussing on achieving business goals,” said Bouch. In an effort to help those business who are unprepared for Brexit, deal or no-deal, or for more general change management advice, we’re offering a ‘without commitment’ 30-minute conversation about preparing organisations for change. To take advantage of this free expert advice email info@leadingchangeuk.com or call+44 (0)203 170 8026 and ask for Mark Bouch.